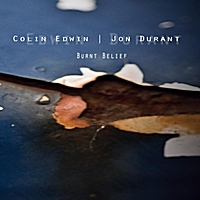 Colin Edwin, bassist of progressive rock band Porcupine Tree has teamed up with guitarist Jon Durant to produce Burnt Belief; a progressive rock instrumental album with influences from a vast array of genres such as classical, ambient, electronic, and jazz. This marks the pair’s second collaboration; the first being Durant’s Dance of the Shadow Planets (2011). Colin Edwin who is best known as a member of Porcupine Tree where he plays fretted and fretless bass is also a member of Ex-Wise Heads; a collaboration with Geoff Leigh. Edwin is also a member of Metallic Taste of Blood which has influences from metal and jazz music. His style of playing usually involves jazz influences which he brings to Burnt Belief. Jon Durant is a guitarist who has played on numerous recordings as well as film soundtracks. He started Alchemy Records in 1996, and serves as the executive producer at the label. Durant’s guitar style is a great mix of influences from free-form jazz and ambient music. Burnt Belief is a great album. Jon Durant’s lead guitar playing throughout the album is a delight, and Colin Edwin’s bass work gives the album a uniqueness you won’t find anywhere else. The genre defying album features Middle Eastern hand percussion, flute, twelve string guitar, and more to give you an idea of the vastness of the music. The album lasting just short of an hour has some notable tracks that any progressive rock fan would love. “Altitude” starts the album off with an ambient feeling. This song highlights Edwin’s amazing bass playing. The next song “Impossible Senses” is one of the album’s best tracks, featuring Jerry Leake on world percussions, whose sounds blend well with Edwin’s bass and Durant’s guitar solos. Another great song from Burnt Belief is “Balthasar’s Key.” The song which features Geoff Leigh on flute is a great rock number with a jazzy feel. Although the track is nearly eight minutes long, it still deserves a listen. “Uncoiled” the longest track on the album at twelve and a half minutes, is a surreal journey of great music. When “Balthasar’s Key” and “Uncoiled” are played together they make a sort of mini album of compelling music which is the climax of Burnt Belief. This album would make a perfect fit to any progressive rock fan’s collection. Any fans of electronic, ambient, or jazz would also want to check out this record. What makes this a great release is its ability to appeal to fans of multiple genres. If you are a fan of any of the genres found on this album you will want to check out Burnt Belief as well as Colin Edwin and Jon Durant.